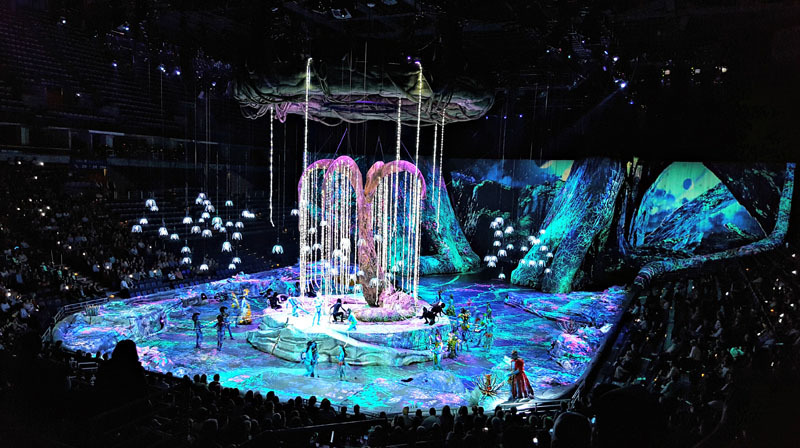 Toruk - the First Flight, a stage show by Cirque de Soleil, is based on James Cameron's Avatar films, located on the planet moon of Pandora, where the blue skinned Na'vi with long tails live together in harmony in a lush neon-coloured jungle thousands of years before the events depicted in the movie and before any homo sapiens set food on Pandora. Well, you might be mistaken, because the story is not what really matters here. It merely serves as the foundation for dazzling acrobatic acts framed in a visually stunning and spectacular live setting courtesy of the pioneering artistic vision of directors and multimedia innovators Michel Lemieux and Victor Pilon. Cirque du Soleil on a arena level, magnificent scale that makes use of an arena sized setting: Infused with its signature style, Toruk: the First Flight presents a rich mélange of the trademark acrobatics (with the aerial stunts and an act using a giant backbone skeleton / vertebrae as a spinning see-saw contraption being particularly noteworthy), masterful puppetry and is guided by the narration of a Na’vi storyteller providing the thin red thread and storyline for the visual spectacle that at times resembles perfectly orchestrated chaos. It proves to be difficult to not feel immersed in the Avatar-styled world of Pandora with camouflaged set lights incorporating the audience, the show offering to use an app to interact with aspects of the performance and the whole arena serving as a stage thanks to the video and light projections that help seamlessly transition sets from a myriad of contexts that could not be more dissimilar in nature. Your humble narrator was also intentionally whipped by one of Na’vi’s blue tails, which gave audience interaction another dimension. The costuming is superb, extremely detailed, intricate and capturing the aesthetics of the Na’vi in the even most contorted positions and the display of overwhelming talent permeates every facet of the performance. Composers and musical directors Bob & Bill meet the challenge of creating otherworldly transitions between scenes that blend in perfectly with their cinematic yet organic sounding music. Having been witness to quite a few of Cirque du Soleil’s previous incarnations, with the franchise at times struggling to maintain the original DNA with some of the newer productions, Toruk - the First Flight certainly not only accomplishes the main tenet of the company’s mission statement, i.e. to invoke the imagination and provoke the sense, but this “Flight” takes it to new unprecedented heights – pun intended. Images from Cirque du Soleil website.